Is there a more efficient method for creating a probability distribution? I have written a short function in R to estimate the expected number of mutations that will be observed in a set of DNA sequences. The parameters are the mutation rate (x), the length of the DNA sequence (y) and the number of stretches of DNA being observed (z). I want to simulate how many mutations one expects to observe in real data, given these underlying parameter values, so I do random sampling using these values and repeat this 100 times to get a distribution of the observed number of mutations. This random sampling is slow when the parameter values become very large. Is there a way to achieve the same outcome using a more efficient method? For example I was wondering if sampling from a poisson distribution could be used instead or if that is not suitable for this case. Thank you for you assistance. Please let me know if I can be more clear. You could use the exact binomial (and it will likely be considerably faster), but the Poisson will be highly accurate. Indeed, this is the ideal situation for the Poisson. It's not clear exactly what you're trying to do with these numbers, which makes it harder to give more suitable advice. Not the answer you're looking for? Browse other questions tagged r sampling poisson-distribution or ask your own question. 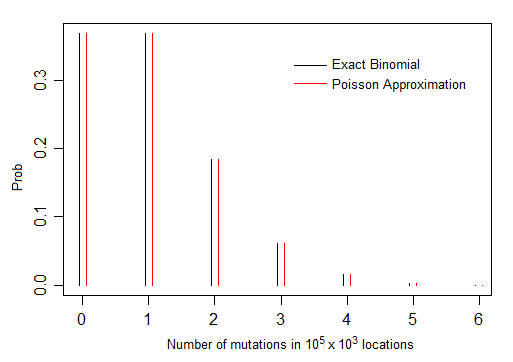 Is using “Normal Approximation to binomial distribution” to test mutation enrichment in genomic region correct? Why should/does(?) statistical sampling work for politics (e.g. Gallup)?